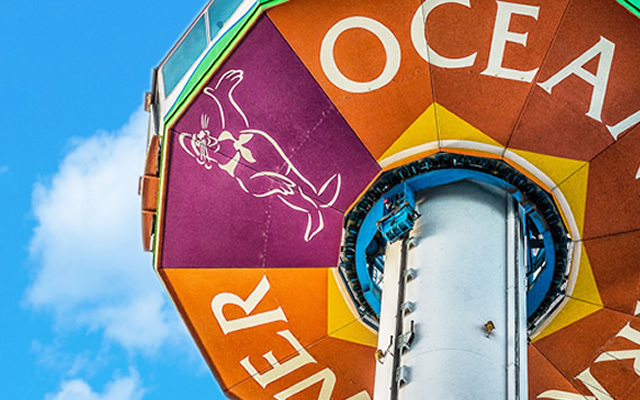 Ocean Park today announced a series of brand-new offerings set to elevate its award-winning theme park experience and strengthen its educational messaging and conservation advocacy. The diverse new offerings include: the unlimited, free high-speed Wi-Fi service1; an upgraded mobile app with innovative functions; and the new signature dishes at all seven in-park restaurants. Guests who download the app from 19 March to 17 April can not only enjoy first-hand experience of the many new functions, but also enjoy a 15% discount on admission upon showing a mobile device with the app at the Ticketing Office and receive eCoupons for other in-park spending. To make learning about animal conservation even more enriching this spring, Ocean Park is partnering with the Hasbro classic board game "Monopoly", for the first time to present “Animal Monopoly”, which will complement a series of limited-time “Get Closer to the Animals” programmes during the Animal Discovery Fest from 19 March to 17 April. The start of Animal Discovery Fest on 19 March also coincides with the first day of this year’s Ocean Park Conservation Day, which will feature a variety of educational activities available to all guests, and all admission revenue from the first day will be donated to the Ocean Park Conservation Foundation, Hong Kong (OPCFHK) in support of its conservation efforts. Guests who have installed Ocean Park’s upgraded mobile app on their smart devices and connected to the Ocean Park official Wi-Fi network could join the “Virtual Guided Tour” at various animal exhibits including The Grand Aquarium, Amazing Asian Animals, Sichuan Treasures, Shark Mystique, Marine Mammal Breeding and Research Centre, and Chinese Sturgeon Aquarium - Yangtze Exploration2. The function offers multi-lingual docent service, as well as information about nearby animal ambassadors, in the forms of texts, still images and videos for a more impactful conservation education experience. The upgraded mobile app is equipped with a function called “eScheduler”, which automatically designs an itinerary according to the guests’ attraction choices, thereby saving queuing time. Push notifications and location-based service will soon be integrated, enabling the mobile app to bounce “eCoupons” and “Promotions” to notify guests of any promotional offers and messages from nearby retail shops and restaurants. All seven themed restaurants in Ocean Park will each offer different signature dishes with a feast for eyes and taste buds, bringing visitors new dining experience. Neptune’s Restaurant, situated beside the Grand Aquarium’s main tank, specializes in fine dining featuring sustainable seafood; whereas Tuxedos Restaurant, which offers a panoramic view of the penguins, uses low-carbon cooking and local organic ingredients to create the new penguin-themed Tuxedos Seafood Pizza. New at Café Ocean, which offers cha chaan teng fare, are Stir Fried Vermicelli with Scallop and Conpoy; Steamed Cod Fish Fillet on Fried Rice in Lotus Leaf and more, giving guests a taste of iconic local cuisines. The Terrace Café, The Bayview Restaurant, Panda Café as well as Aqua City Bakery also offer many unique signature dishes to cater for different tastes. To make conservation education more fun, Ocean Park has partnered with the Hasbro classic board game "Monopoly" to present the activity “Animal Monopoly” during Animal Discovery Fest, from 19 March to 17 April. Giant Monopoly check points will be placed at 17 animal exhibits to present information on various animal ambassadors, giving families and friends a fun backdrop for photos. Guests collected a whole set of photos taken at Monopoly check points of the same colour will have a chance to win different prizes, including Monopoly souvenirs and Ocean Park tickets. Monopoly-themed dishes will also be introduced in in-park restaurants. Limited-time spring activities and offers also freshen the Ocean Park experience, including the family-oriented Playful Animal Painter and behind-the-scene programmes. Participants of Playful Animal Painter can have a close observation at Asian small-clawed otters and Sichuan golden snub-nosed monkeys before drawing their portraits on postcards. The activity lets adults and kids alike hone their observation skills, discover the animals’ interesting features while unlashing their creativity. Families can also join behind-the-scene programmes to explore back-of-house facilities and deepen their knowledge about precious animals such as giant pandas, sea lions, sharks and capybaras. From 19 March to 31 May, Ocean Park will present special companion fare offers for two “Get Closer to the Animals” programmes – “Honorary Panda Keeper” and “Seal Encounter”. Guests should not miss the Amazing Animal Garden at Waterfront Plaza which offers awesome photo spots with the animal topiaries. The annual signature event “Ocean Park Conservation Day” will be held on 19 and 20 March this year. It will not only feature activities and game booths themed on “biodiversity”, but also present complementary guided tours of Emerald Trail for an up-close encounter with the critically endangered blue-crowned laughing-thrush as well as wild birds and trees in the Park. Ocean Park Wi-Fi network has around 400 hotspots across the park, supporting more than 40,000 mobile devices. To enjoy the free unlimited high-speed Wi-Fi service, guests will need to enable the Wi-Fi function in their smartphones or devices, and select from one of Ocean Park’s official networks: OceanPark Free WiFi; or OceanPark Free WiFi Encrypted. Guests can also select Wi-Fi.HK via OP to enjoy free Wi-Fi service for 30 minutes per day (Ocean Park has been invited to join Wi-Fi.HK initiated by the Office of the Government Chief Information Officer of HKSARG). The installation of in-park Wi-Fi is about 90% complete. Coverage for outstanding areas such as the Ocean Express tunnel will begin in April onwards. The Virtual Guided Tour function is currently available for The Grand Aquarium, Amazing Asian Animals, Shark Mystique, and Sichuan Treasures. It will be extended to Marine Mammal Breeding and Research Centre and Chinese Sturgeon Aquarium - Yangtze Exploration in late March.